Home Income Tax will I be taxed on sale of agricultural land? 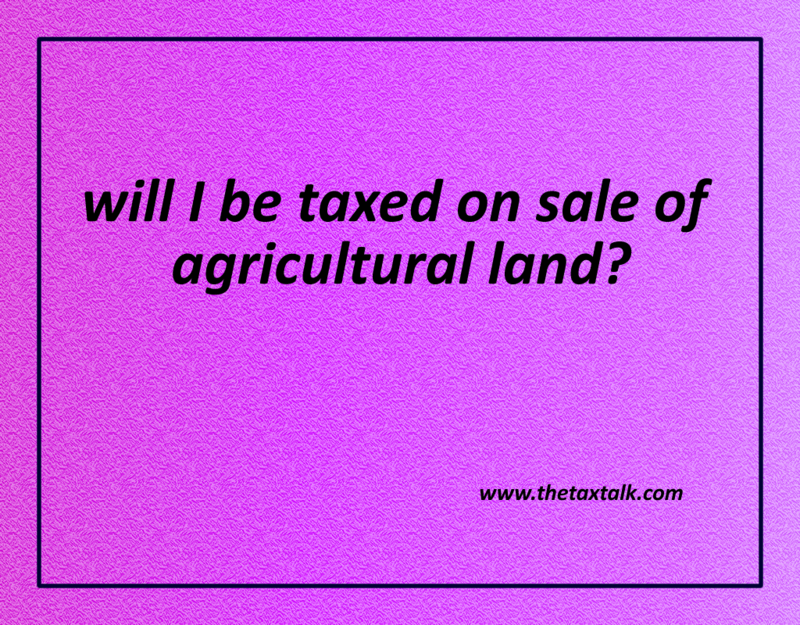 will I be taxed on sale of agricultural land? I had purchased an agricultural land in the year 1987 out of my salary income & gift received from my father. The land was given on contract farming and I was earning small agricultural income on it. I am planning to sale it now for a hefty sum of Rs. 2.78 Cr around whereas the government valuation of the property is only Rs. 1.27 Cr. The land is an old agricultural land with no part as non agricultural. I seek your advice as to whether I am liable to pay the tax on sale of agricultural or not? To the best of my knowledge, agricultural income is tax free and so is the profit on sale of land. If still I am liable to for income tax, how it can be saved either by investing in another land or by investing in bank FDR? Kindly suggest me the means by which tax can be saved if it is applicable. If the agricultural land is situated within the radius of 2 kms/ 6 kms / 8 kms as mentioned above, then depending upon the period of holding, the profit arising on sale of agricultural land will be taxable as Long Term or Short Term Capital Gain. In your specific case, if the agricultural land is situated within a radius of 2/6/8 Kms as mentioned above, then some portion of surplus arising on sale of agricultural land would be taxable as Long term Capital Gain (LTCG). The tax rate for LTCG is @ 20%. However, if the land is outside the radius of 2/6/8 Kms as mentioned above, then nothing would be taxable as income and entire surplus would be tax free. a) Capital gain arises on transfer of Agricultural Land. b) The Agricultural Land is used by the tax payer or his parents for agricultural purpose for a period of two years immediately preceding the date of transfer. c) The taxpayer has invested LTCG towards purchase of another land for agricultural purposes within a period of two years from the date of transfer. To save tax u/s 54EC, taxpayer have to invest the amount of LTCG in the Specified bonds REC/ NHAI within a period of 6 months from the date of transfer. However, there is a maximum investment ceiling of Rs. 50 Lacs for investment in 54EC Bonds. Effectively, LTCG up to Rs. 50 Lacs only can be saved u/s 54EC. For exemption u/s 54F, subject to various other terms / stipulations, you have to invest the amount of net sale consideration for purchase of a residential house property within a prescribed period. The transaction of gifting the money to the family members would be tax neutral. The income from the amount gifted would be taxable in the hands of the family members only. However, any income from money gifted to spouse or daughter in laws would be subject to clubbing provision and income from the gifted amount would be taxable in your hands.